Some while ago Microsoft Project Online got an upgrade for the resource management discipline. The new “Resource Engagements” feature became available for Project Online and Project Server 2016 about a year ago. “Resource Engagements” are great but bundled with the brand new app called “Team Planner” , the user experience just got a dramatic upgrade. Basically, “Team Planner” ensures that Project Managers can request and work with resources directly from a Project Detail Page. “Team Planner” uses all the backend power of “Resource Engagements”, meaning all changes are stored in the Project Online database for easy and out-of-the-box reporting. In summary, Project Managers can within seconds create a resource plan or a resource request. They can set up custom breakdown such as phases, sprints or program increments, meaning its useful in both waterfall and agile scenarios. Once the resource plan has been created, the request will arrive at the respective Resource Managers for approval and final resource allocation. The user interface allows for drag´n´drop to save time for the end users. When using “Team Planner” as a Resource Manager, you would probably open up the web part (app) in a full screen experience from a regular SharePoint page. This way, Resource Managers will simply see all projects impacting only their department, which resources are available, comments from the Project Managers and much more. Besides the overview across departmental resources and projects impacting them, Resource Managers can also click on a resource, and see what they are booked to. 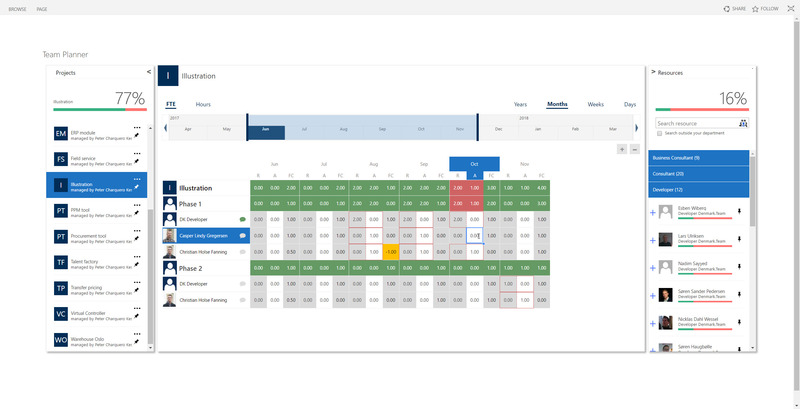 Resource Managers also get a real-time heatmap experience when allocating resources, showing if a person is over-allocated, or if a request has not been handled. When resources are allocated to the projects, the Project Managers automatically gets the resources into their project team for easy allocation in Microsoft Project Professional (client). Looks like a great app, hoe my clients will start using it, would love to implement this one! One question: Is the license per user or per PWA url?